Continuing our member focus series I am delighted to introduce Aimee from Aimee Dunne Events who is one of our associate members. Aimee is based in Kent and covers the Kent/London/Surrey regions. Having spent many years working in the banking industry, I always knew my heart wasn’t really there. I was spending all of my spare time finding events to manage and helping manage friends and family events wherever possible. It sounds corny but I really do live for events; I love having something to look forward to and I love the buzz of creating something where guests can really enjoy themselves and look back with great memories. I’m also ridiculously organised and a perfectionist – which helps when you’re a wedding planner! Through my years in the banking industry I attended many elaborate corporate events. I also have close links with the professional football industry and have attended many high profile weddings and events. Throughout these I’ve attended some wonderful but also not so wonderful events and have learnt that it is not just a case of throwing money at them. It is understanding and getting to know clients and ensuring their day is truly personal and special no matter what their budget; I’ve certainly learnt that more money does not mean more class! Chewton Glen in New Milton, Hampshire. This is one of the most wonderful places I have ever visited (and I’ve stayed at hundreds of hotels!). The service, food and wine is absolutely faultless. The location just on the edge of the New Forest, 5 minutes from the beach, yet only a couple of hours outside of London is hard to beat. You can’t help but relax; a truly special place. A perfectionist. I can’t help but agonise over every detail and plan every wedding as though it were my own. Have you ever had a challenging client and how did you deal with it? Oh yes! I often have clients who contact me very regularly and ask me many questions, some being very similar and asked repeatedly! In this situation it is usually because brides to be are slightly worried about things which is completely natural, and I do my best to reassure them and put their mind at rest about whatever it is that’s concerning them which usually works. 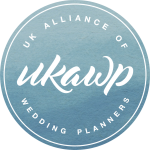 A large part of this job is dealing with the personal side of weddings and client concerns and worries and I think this is something that planners need to understand and something that personally I enjoy. I love horse riding. I live in Kent which is a beautiful part of the country to go riding in and we have some lovely stables by us. I also love good food and wine! If you could plan a celebrity wedding (alive or dead) whose would it be? Simon Cowell – what a complete challenge that would be! Preston Bailey. I absolutely love how he completely transforms spaces, mostly with flowers but he’s also done so with lighting and even paper. I have his books all over the office and they continually inspire me as to what absolutely amazing and breath taking events can be created. I love the wow factor! What themes are you working on for 2010? Sweetie tables and candy colours seem to be hugely popular and definitely the one which is most often requested by clients so I’ve been working on these lots – and eating many of my supplies! What’s your biggest achievement since launching? Attracting some press – although this is still work in progress! No one can over estimate the effort needed in PR. It has been a real eye opener since launching and although I expected this to be hard work, I didn’t realise how much! Pink champagne and Pimm’s. Not necessarily at the same time but I’m not fussy! ← The Benefits of Associate Membership continued..